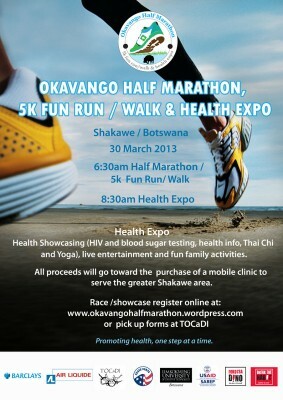 This past Easter weekend I was all the way across on the other side of Botswana helping with the Okavango Half Marathon, 5K and Health Expo. I have been collaborating with two Peace Corps Volunteers on the this project for months. This event was the brainchild of my friend, Peace Corps Volunteer Dinah Sandoval who serves in Shakawe. 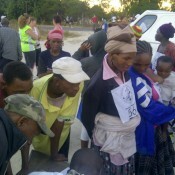 The event was part of a larger project to expand health care access in the Okavango Sub-District in northwest Botswana. Dinah wanted the event to inspire the community to live healthier lives and to raise funds for a mobile health clinic/ambulance to bring primary care services to hard to reach areas in the greater Shakawe community. Dinah brought Peace Corps Volunteer Carolyn Mambu in on the project because Carolyn lives in Gaborone, the capital, where most of the larger donors are headquartered. Carolyn also has a lot of experience in event planning and fundraising. Around January of this year, they realized they needed an online presence so they asked for my help. I created a web page for the event to give information to the public, and which allowed people to register online; as either a Race Participant, a Health Expo Exhibitor or a Health Expo Vendor. My job was to maintain the web page updating information as needed. I also was in charge of keeping track of the registrants who registered online or emailed their race application to the special Okavango Half Marathon email address I created. As the race approached there was a lot of work for me to do. As sponsors came on board, their logos were added to the web page; new registrations came in every day; travel and lodging information had to be added; and the spreadsheet of registrants grew larger. Carolyn and I had run in a lot of races, Dinah never had. None of us had ever ever organized one. Carolyn and I thought about all the races we had been in and determined what we would need. Water, cups, tables, tents, caterers, a DJ, etc etc. In addition to the details of the race and expo, lining up sponsors was a big job. Dealing with sponsors and vendors was especially challenging here in Botswana where everyone seems to run on Africa Time, even businesses. Everything was done at the very last minute, if at all, and we were all on pins and needles, wondering if we were going to have to go to “Plan B”. As I mentioned in an earlier post, originally I was not going to go to attend the event. I just didn’t want to make that long trip. Dinah and Carolyn wanted me to come and figured out how to get me there. First, they found me transportation so I didn’t have a two day bus trip with a layover in Maun. Carolyn’s friend Jay was driving and she got me a spot in his comfortable, air conditioned SUV. Dinah then got Drotskys Lodge in Shakawe to comp some rooms for the event and she got me in one of them. With the prospect of an easy trip (although it was 14 hours each way), and luxurious accommodations I relented — I was coming. We had wanted to leave Gabs Thursday morning at five am. Unfortunately we did not get on the road until 10 am because we were still waiting for the t-shirts to be finished (like I said, last minute or not at all). We arrived around midnight on Thursday. We used a lot of the trip to review what had to be done and who would do it. The drive was pleasant until the sun went down and the donkeys and cows gathered on the road. I am told they like the paved road because it holds the heat, and in the evening it is the warmest place. As if that wasn’t bad enough there was an stretch of very thick fog (very unusual for Botswana). The combination of fog, bad roads and donkeys, cows and goats suddenly appearing in the headlights walking toward the car made for a stressed driver. Someone in the car said it remind him of what scenes from a “cow-zombie” movie would be like. At one point the driver hit the brakes and I looked up to see the largest Kudu I have ever seen standing in the middle of the road. The car stopped just feet from the startled Kudu who immediately ran away. The only other wild animal we saw on the drive was a jackal seen about 50 meters away from the road. 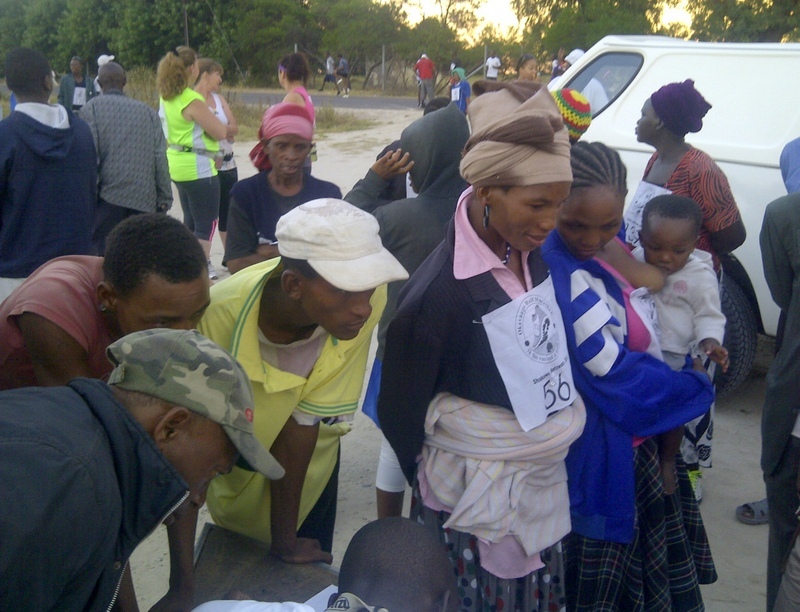 On Friday morning I got ready to open a table to register new runners and to receive fees from pre-registered runners. The table was to be open from noon until five. I had two Motswana and one Canadian volunteer to help man my registration tables. In America people seem to understand that there has to be some order and we naturally get in lines. Here in Botswana there is no order, there is a chaotic crowd pressing in on the tables, and more coming up behind us. Everything went well, but even though we stayed open until 6:30, we realized we had a lot of people who had not shown up to pay their fees. We realized we would have to continue registration the morning of the race as well. While everyone else went to eat, I went back to the room and stayed up until midnight updating the registration spreadsheet, and reconciling with the money we had collected. The next morning, the morning of the race, we left Drotsky’s at 5 am. Dinah and Carolyn went off to handle their duties and I manned the registration table once again using a headlamp because the sun was not up yet. We had a large number of students who were running because a very kind donor from Pandamatanga paid 3,500 Pula to fund 100 students, many of them crowded in on our table again, along with people who had waited until the last minute (there is a pattern here). In fact, we held the start of the race until we could register more people (so I guess we were guilty of being late as well). Finally the race registration was over. I put the materials and cash box into my backpack and looked forward to watching the start and hanging out with people until finishers started coming in. My work was done – I thought. I saw Dinah walk by and asked her if her finish line volunteers had done a dry run to be sure their procedure would work. She laughed and said, “I thought you were going to do that.” YIKES. Yikes indeed. In our race we had advertised that in the Half Marathon race we were going to give cash prizes to the 1st, 2nd and 3rd paces in 4 different categories plus the largest prize (1,200 Pula) to the overall winner. A total of 7,600 Pula. We had to get the finishers and times correctly, or there would be drama. I could just imagine an awards ceremony in which we announced that we did not have a clue who won; or if we announced the wrong guy and the real winner runs out and starts complaining. So I corralled my two volunteers from the registration table and we worked out how we would do this, with a spotter calling out the race numbers of the Half Marathon finishers, and another guy writing down the numbers and another guy writing down the times. “Did anyone start a stop watch?” I asked. We could get by just knowing who won, we didn’t have to know the time, but it would be nice. Then we caught a break, one guy saw someone who started a stop watch on her BlackBerry. He went and found her and brought it to our table. We practiced our method as the 5K runners started to come in and it seemed to work. Then did it for real when the Half Marathon runners came in. 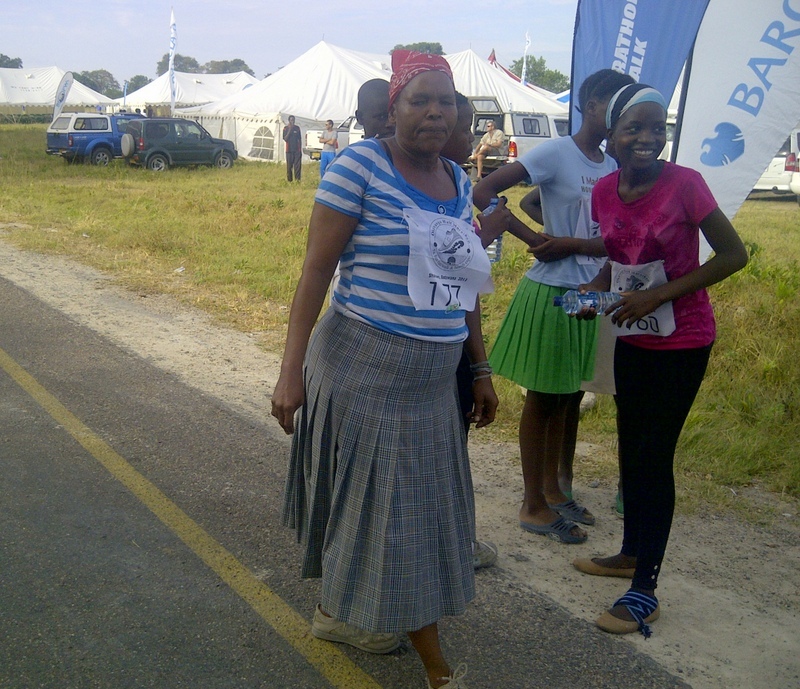 The winner was a young Motswana named Tops Motapwa who ran a very fast time of 1:09:00. After we had captured enough places and times to be sure we had all of the prize category winners, I took the paper inside a library nearby and fired up my laptop and figured out who won the prizes. Once I had delivered that information to Carolyn, who ran it over to the awards ceremony, my job was finally done. I spent the rest of the afternoon perusing the Health Expo exhibits and watching as local artists in traditional dance, singing and drama entertained the crowd. One of the coolest thing about the event was how invested the community was. We had volunteers from the community, and local companies gave in-kind donations as well as cash. Many locals ran in the race, of all ages. 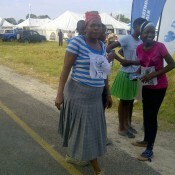 There were many “mosadi moholo” (old ladies) who ran in skirts and sweaters, many of the locals ran in bare feet or sock feet. It was amazing. There was a large contingent of Peace Corps Volunteers who came to run and/or volunteer or exhibit in the Health Expo. 27 Volunteers plus the Country Director, his wife and one other member of Peace Corps staff showed up. The race itself went on with only a few hitches. Out on the race course ran alongside the runners as they passed small villages, and of course they had to slow down and go around the occasional cow or donkey. That night we were all relieved, happy and exhausted. We all went to a bar in Drotsky’s to unwind with some well deserved drinks. The whole team was there, Carolyn, Dinah, and myself; plus Jay our driver and Jeremy and Salewa who had come along to help were there as well. The Country Director, Tim Hartman, and Tim’s wife were staying at Drotsky’s joined us. Tim had committed to donating 1 pula for every mile any Volunteer ran. I think the total his commitment came to was about 400 Pula. He showered us with a lot of praise, then opened his wallet and generously gave 1,200 Pula to our cause, which was well over his commitment. I really am grateful that Dinah and Carolyn invited me in to this project to help them out. It as one of the most satisfying things I have been involved in here in Botswana, and one of the most fun. We succeeded in getting the local community some much needed health information; and once the promised corporate donations come in, we will have raised enough money for the mobile health clinic/ambulance that they needed. As it turns out this was my last big Peace Corps project and it turned out to be one of my favorite. This entry was posted in Peace Corps, Service - Year 2 and tagged Botswana, Mobley, Peace Corps, Road Race, Shakawe. Bookmark the permalink. So glad your project was successful. You must feel a great accomplishment. Job well done.